I am suffering from possibly the most middle class complaint of all time. Farmers market envy. Yes, I actually said that out loud. I keep stumbling upon blog posts with photos from US farmers markets, with shoppers clad in overpriced yoga wear sipping their unicorn roasted single vineyard drip coffee while poking away at ton upon ton of amazing fruit and interesting heirloom varieties of carrot. Most of these places (based on the pictures at least) make Borough Market look like the fruits of one man’s small allotment on the edge of the M25. And then it makes me think, too, of going to tiny towns in France and Italy were they have the same sort of thing, week in week out. Our farmers markets, in London at least, seem to me to be around 10% fruit and veg, and 90% sausage sandwiches, pesto and chocolate brownies. I am not saying that there is anything wrong with those things, and they definitely have their place on our markets, but I just think we have the balance sort of wrong. Yes, I know we don’t have the climate of California or Puglia but surely we are growing enough to fill a few more stalls each week? I am sure they are just meeting demand and can’t really be criticised for not wanting to go bankrupt – I was totally guilty of only buying a sausage sandwich and the odd loaf of bread for the first year our local market was open, while buying all my fruit and veg from Ocado. I don’t have an ANSWER to any of this, by the way. Or a point really. It is merely something that I wanted to get off my chest and a post about spring vegetables seemed like the appropriate place. Shall we move on? 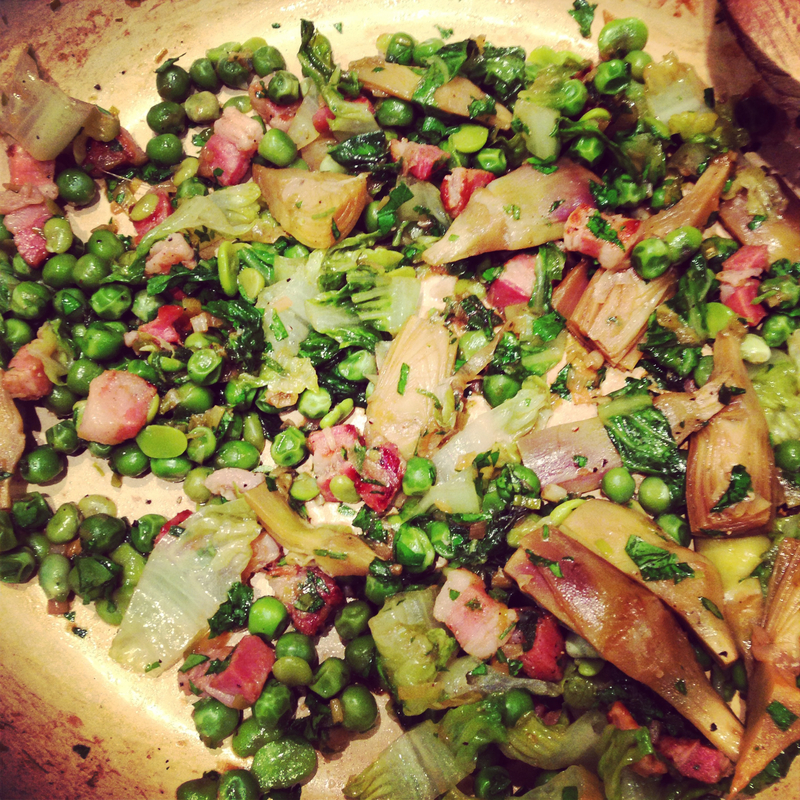 This spring vegetable stew came into our lives while eating artichokes almost exclusively for weeks to write my artichoke missive and involved a small amount of trial and error. Which is not really a thing you want when it involves shelling peas and broad beans and tackling artichoke thorns and so I am going to share my failure with you before getting to the real deal. You know, sort of a show my workings thing as you are always told to do at school in the hope that you’ll still get some marks when you get some very basic maths problem completely wrong. I had wanted to do a sort of sauté/braise kind of thing similar to those we had eaten in Italy, to use up the artichokes and some other vegetables we had kicking around following an over-exuberant trip to the greengrocers. And so I went first to the River Cafe cookbooks, because where else would any self-respecting English person look for any sort of Italian vegetable thing? 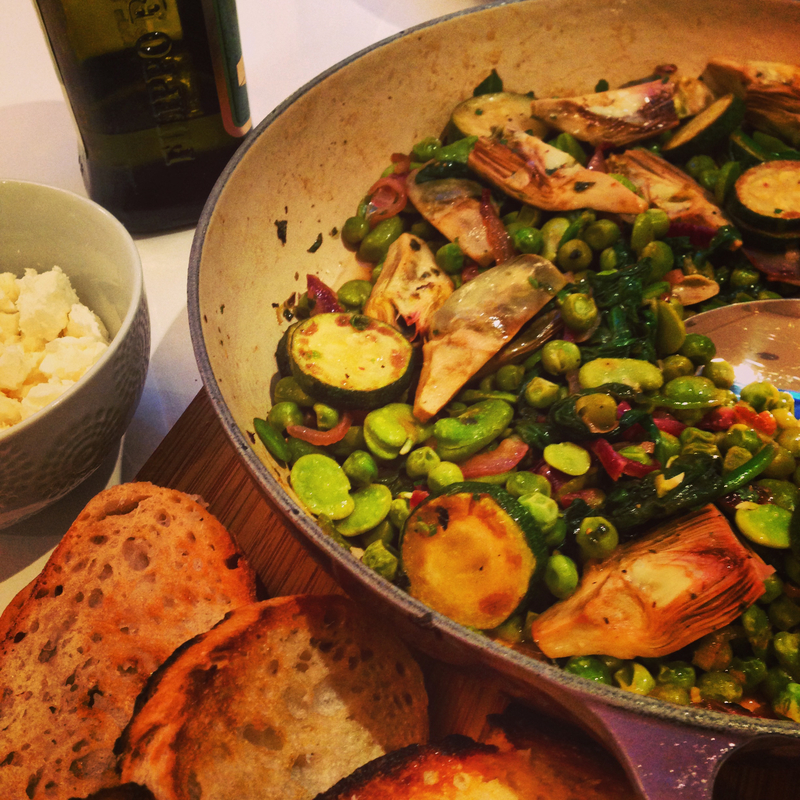 The River Cafe had – or so it seemed – just the ticket: a braise of broad beans, peas and artichokes, their version of the Sicilian dish, frittedda. In common with most Italian dishes, there is almost certainly no definitive recipe for frittedda (or frittella as it is also called), a classic spring time dish from the Palermo area. As Giorgio Locatelli so perfectly puts it in Made in Sicily – an Italian dish will be made slightly differently in every town, every village and even every house, with every one claiming the authentic version. From what I can tell (and no doubt risking the wrath of many a Sicilian), frittedda is traditionally made only with artichoke, peas and broad beans, albeit versions abound on the internet with asparagus and new potatoes thrown in too. Which sort of makes sense – what grows together, goes together and all that. The River Cafe version that I went with can be found here (it’s from The River Cafe Cookbook Two) and was, unsurprisingly, extremely simple and relied heavily on finding the freshest artichokes, peas and beans ever created in the history of vegetables. No garlic. No stock. No vinegar. No nothing. Just the braised vegetables with some fried red onion and lifted by some herbs, lemon juice and no doubt sublime (and eye-watering expensive) extra virgin olive oil. Fine if you are running a wildly successful restaurant that gets vegetable deliveries (usually from Italy) every morning, more ambitious if you’ve let your vegetables sit in the fridge for a day or two and only have a bottle of Filippo Berio to hand. Now, this is all perfectly obvious with the benefit of hindsight, but I hadn’t cooked from any of the River Cafe books for ages and had forgotten how rarely their (deceptively simple) recipes come off well in my kitchen, and so I ploughed on. I did have a quick look at Claudia Roden’s version in her The Food of Italy for reassurance first and as that was even more simple again – just vegetables, spring onions and olive oil – I figured that the River Cafe version would be positively bursting with flavour. River Cafe Frittedda (with rogue courgettes). Pretty Average. Guess that? It wasn’t. It was a bit flat. It was good, and was elevated greatly by lots of extra olive oil, a ton of feta cheese – ricotta salata would have been a more authentic choice but you do what you gotta do with your fridge contents – and some sourdough toast. But it was not great. (You will see that for some ungodly reason added some courgettes. I have no idea why I did this. They had no place there whatsoever. Do not do this). Now, between you and me, I think the River Cafe are with me on this one, because lo and behold when you look in their (later) Pocket Salad and Vegetables book, both garlic and white wine have managed to make their way into the frittedda they include there. (They say that frittedda is a Roman dish, rather than a Sicilian one. I am pretty sure that is a flagrant lie. But then I am equally sure that a Roman will tell you I am lying as well. Viva L’Italia). This newer version looks much more like a winner, as does Locatelli’s version in Made in Sicily that doesn’t stretch to garlic but whacks a very respectable slug of white wine vinegar into the mix, which I think would be really very welcome indeed. But do you know what else would be welcome? Salty pork product. That’s what. As any faithful disciple of Nigel Slater will know, there is no vegetable based casserole, stew or soup on his earth that cannot be improved by the addition of a little chorizo or pancetta. And as it so happens, you can add pancetta (and lettuce) to Sicilian frittedda, call it Roman vignarola and still claim that you are being authentically Italian. The version below is based on one in the Rome Sustainable Food Project book Verdure, with pancetta added on the basis that all of the online recipes I (self-servingly?) found included it. Before somebody hits me around the head with a copy of the Daily Mail, I do recognise that as far as meat eating goes, processed meats like bacon and sausages should be very much at the ‘very occasionally’ end of the spectrum as there have been countless studies clearly linking their consumption to many different cancers. But you are going to struggle to convince me that eating 25g of the stuff in a dish full of vegetables from time to time is going to do me a great deal of harm. (Most of the studies saw strong correlations with cancer rates in people eating more than 100g of processed meats PER DAY. Recent guidance is to eat no more than 20g a day – difficult if you live on sausages and Findus crispy pancakes; less tricky if you have a few cubes of chorizo in your soup from time to time). June is, I realise, hardly ‘spring’ but we are certainly slightly behind the Italians in our vegetable seasons and there are still plenty of good peas and broad beans on our markets and in the supermarkets now, and artichokes will be around for the next few months. As the weeks go on, the broad beans will be getting a bit bigger and tougher skinned (I made this last week and only about a third were OK to eat without being skinned) but they are still delicious, even if requiring a little more work. With both peas and beans, if you can’t be sure that they haven’t been sitting round for days since being picked, go for frozen. 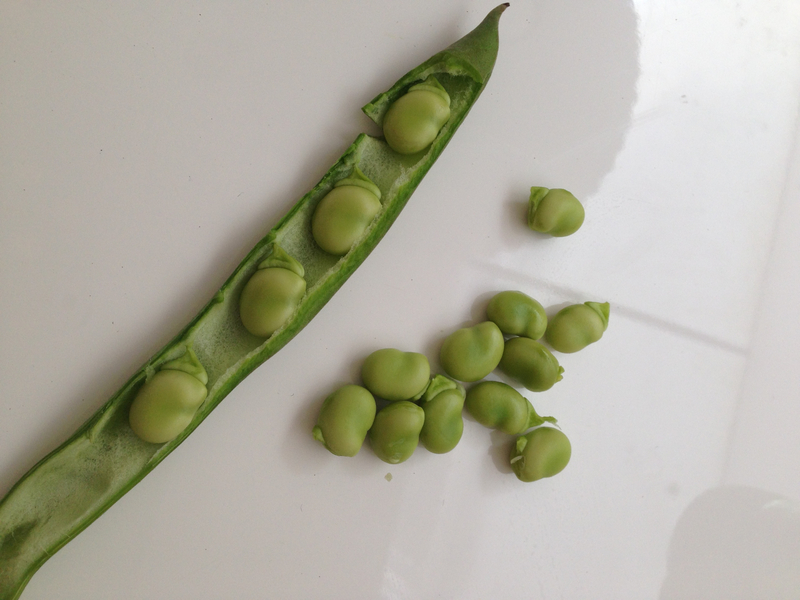 Peas and beans convert their natural sugars to starch once picked so are best eaten very soon after picking. Frozen peas are frozen very soon after picking, locking in their natural sweetness and make a superior alternative to ‘fresh’ peas that have been sitting around. I used fresh broad beans but frozen peas when making the version below. The Verdure version uses green (new season/spring) garlic but most other recipes I found didn’t include it. I added a couple of finely sliced cloves and thought it was a welcome addition but it depends whether you want that garlicky note or not I suppose. You can eat this many ways – over pasta, on its own with toast, with a fried or poached egg on top or as a side dish with meat or fish. In keeping with the Spring theme, we had it with some grilled lamb cutlets (marinated in garlic and rosemary) and oven roasted new potatoes. And very very good it was too. Whatever you do with it, it is best eaten warm or at room temperature, rather than straight from the pan. I have given quantities below but you really can adjust this depending on what you have, and what ratio of vegetables you want – more peas and fewer artichokes will result in a sweeter dish, for example. As long as you keep (broadly) to the total vegetable weight, you will be fine (and you can always adjust the pancetta etc. if you want significantly more or fewer vegetables). The original recipe had really long cooking times (22 minutes braising for already parboiled artichokes). My research suggests that the Italians tend to like their braised vegetables to be really soft. I prefer something with a little bit more bite to it so I have reduced the braising time quite significantly. You will have to play it by ear slightly though, depending on the size of your artichokes, freshness and size of the peas and your own vegetable firmness persuasions. Bring a large pan of water to the boil and add some salt. Add the artichoke quarters and cook for 3 minutes. Remove and leave to cool. Next, throw in the broad beans for another 3 minutes, and then remove with a slotted spoon and pop into some ice cold water (or just run them under the cold tap in a colander for a bit until cool). Keep back around 1 cup of the vegetable cooking water. Peel the broad beans unless they are very very small. Heat the one tablespoon of olive oil in a heavy based wide saucepan (I used a cast iron shallow casserole) and gently fry the pancetta and spring onions over a medium/low heat until the pancetta is turning golden and the onions are translucent. 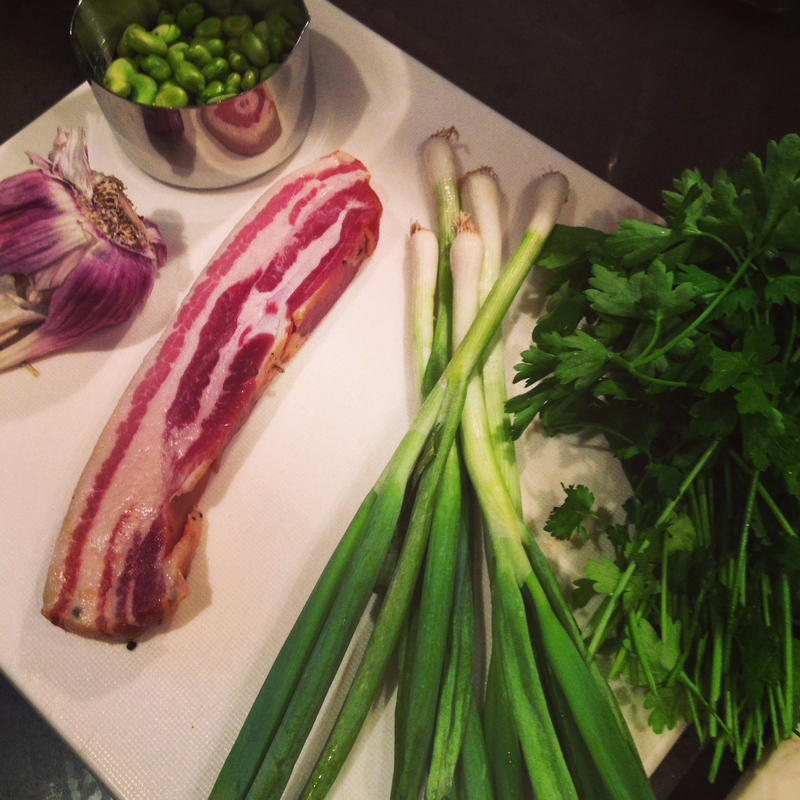 You may need to add a little more oil depending on how much your pancetta releases. Add another tablespoon of oil to the pan and throw in the garlic (if using), mint and the artichokes, stir together and cook just until the artichokes take on a bit of colour, taking care not to burn the garlic. Throw in your cup of reserved cooking water and let it all simmer away for about 6 minutes. Add the broad beans and cook for a further 2 minutes and finally add the peas and cook for a further three minutes or until all the vegetables are tender. Add the lettuce, stir well and cook for a further minute and then take it off the heat. Stir through the parsley, check for seasoning and serve with a drizzle of extra virgin olive oil. How refreshing to find a food blog that’s a joy to read. Usually I skip the preamble and cut straight to the recipe. I don’t know what’s so funny about the words ‘salty pork product’ but they made me laugh out loud. Recipe looks good. Will bear in mind for summer (minus courgettes).